Our furry companions let us know how happy they are with a wag of their tail and a rub of their head, but some of their behaviors are a little baffling. Dogs may shake their legs when you rub their bellies, and cats might bring you a dead rodent as a gift. That's not exactly how humans show pleasure! These behaviors seem confusing, but they're actually quite positive (as positive as dead rodents can be, we suppose). Here's why our pets do some of the strange things they do and how we should react. As a cat parent, you've probably woken up to find a toy mouse or, if you're not as lucky, a dead mouse at the foot of your bed. Rather than punish your kitty, give them some love. They're simply showing their affection for you. Deborah Barnes, vice-president of the Cat Writer's Association and author of Makin' Biscuits – Weird Cat Habits and the Even Weirder Habits of the Humans Who Love Them, says this behavior is natural for felines. "Even well-fed indoor kitties feel the urge to hunt and will drop the spoils of their victory at your feet, such as plush toys or a fake mouse, and your fearless hunter should still be praised for his exceptional skills," she recommends. Simply dispose of any unsavory gifts quickly and without fanfare. Better yet, keep your furry friend indoors, and you're sure to get toy mice at your feet instead. 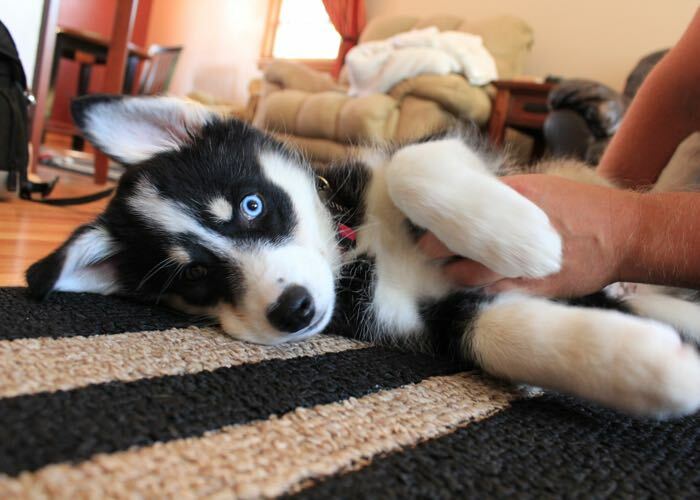 If you've ever given your pooch a good belly rub, you might wonder why they shake their leg. According to Sabrina Castro, DVM of Vetted Pet Care in Los Angeles, dogs do this because the nerves in their bodies are reacting to the stimulus of your touch. "Your dog's body sends a message to her brain that there is an irritant like a twig or branch in the area being touched, and her reaction is to scratch that irritant away," says Dr. Castro. Your dog may even appear surprised by this reaction because it's a subconscious reflex. Don't worry though, it doesn't mean your pooch isn't enjoying the scratching. But, if you see your pooch's leg shaking even when you're not rubbing that adorable belly, they may have fleas or dry skin, so visit your veterinarian to check it out. It's mealtime, and your cat seems intent on tripping you before you can reach for that can of 9Lives® Meaty Paté Super Supper® cat food. Your kitty isn't trying to harm you. They're trying to mark you with their scent by rubbing against your legs. "Scent is very important to cats, and when they do this, they are scent marking. Cats release their scent from glands along their forehead, chin and lips," says Dr. Castro. It's quite the compliment because your kitty is claiming you as his own. If the behavior becomes a little annoying at mealtime, Barnes recommends waiting to feed your cats until they stop marking you. "Habits come quickly to cats, so if the owner prefers not to encourage the rubbing and darting behavior, it will require not rewarding the cat on demand." Ever take your pup out for a walk only to have them roll in a stinky mystery substance? Mark Van Wye, certified dog trainer and CEO of Zoom Room Dog Training, says this behavior is known as "scent rolling." "It is possible that dogs roll in pungent stuff—not all of it bad—in order to retrieve and store information that they can then take back to their buddies in order to socially share this information," he says. Your pooch might also be trying to mask the scent with theirs or cover up their own scent with something new. Don't punish your pup for this natural behavior—unless they consider a bath punishment. And, when you're out, keep them leashed to prevent the next stink safari. Does your furry friend do anything weird and cute? Let us know in the comments below! Photo Credit #1: "Ted, and his prize" by gsloan via Flickr. License info. Photo Credit #2: "" by Lindsey G via Flickr. License info.